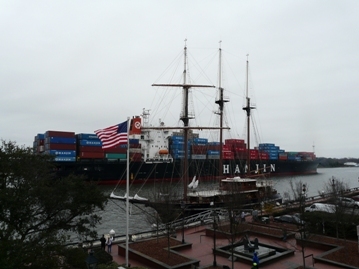 Here’s a picture from the balcony of my room overlooking the Savannah River, of a South Korean container ship heading downriver toward the ocean (to the right in this image — the view is toward the northeast), with an old barquentine in the foreground. Well, actually, not so old. It was actually built a couple decades ago, based on concepts from the eighteenth century. Note that it’s still overcast. Since leaving the Sunshine State a couple days ago, I haven’t seen the sun. I’m not complaining, though. Florida sun has the same depressing effect on me that rain in Seattle has on others. It would be nice to get some nice light for a few shots of the town before we leave, though. Off to the left of this photo is a truly awful statue to the victims of American slavery. Not that there should not legitimately be a memorial to the victims of slavery — but not this one. The sculpture is grotesque, and across the base is a portion of a Maya Angelou poem that I will not quote in a family publication. How could we have done anything in this nation with such tiny ships? Clearly we should have waited for the Panamax heavy lift before trying to settle this country…it would have been so much more efficient.